Roadmap can only have one Account Owner. 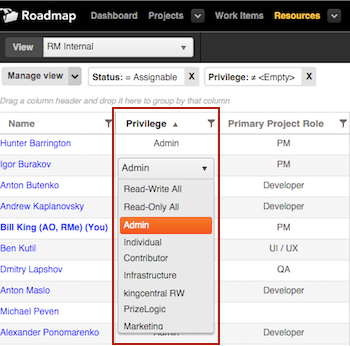 To grant Admin privileges to an existing user, go to Resources Tab, and under any grid view, navigate to (or add) the "Privilege" column and select "Admin". Current Account Owner goes to Account Settings > Personal Info, clicks "Transfer Owner", and selects the user to transfer account ownership to.